Global demand for prefabricated housing will rise 2.7 percent annually through 2019 to 3.4 million units. Gains will be driven by the Asia/Pacific and Africa/Mideast regions and by Central and South America, based on advances in overall housing activity as well as increasing market penetration of prefabricated housing. 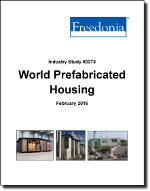 This study analyzes the 2.9 million unit world prefabricated housing industry. It presents historical demand data (2004, 2009 and 2014) and forecasts (2019 and 2024) by type (manufactured and modular housing, temporary prefabricated housing, panelized and precut housing) for six world regions and 20 major countries. The study also considers market environment factors, details industry structure, evaluates company market share, and profiles 40 industry participants, including Daiwa House, Persimmon, and Asahi Kasei.